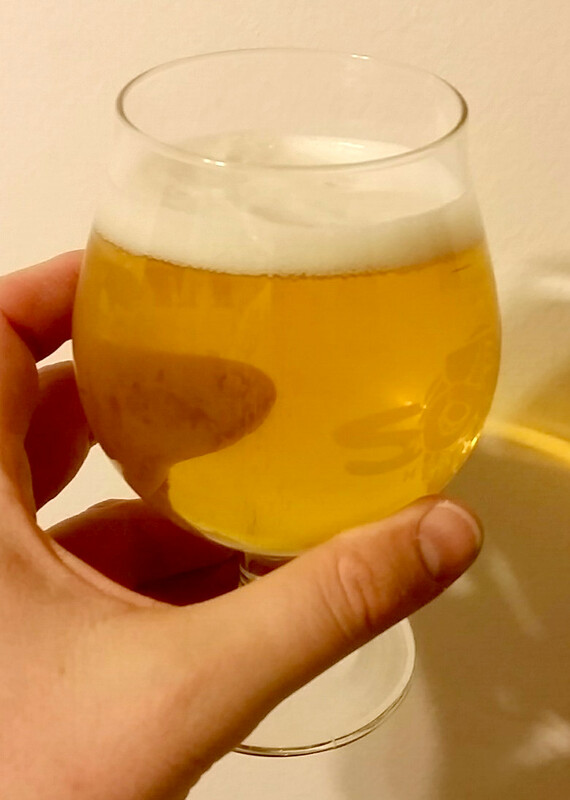 The second iteration of my white IPA recipe is just a touch closer to perfect, with only a few last things to tweak. So close, but not quite there yet. Strong hops aroma, but not overpowering; citrusy with slight hints of tropical fruit. I don’t get much if any malt coming through in the aroma. Very clear and straw-colored, with a low but persistent fine white head. This beer has cleared up considerably since the keg was first tapped. The balance is towards the hoppy side, with citrusy and floral hops at the front of this beer’s flavor. There is a very light malty background. The bitterness is surprisingly low, more in pale ale than IPA territory. What bitterness is there is fairly smooth, with a gentle but noticeable finish. This is a light-bodied, moderately dry beer. The moderate carbonation is appropriate for an IPA. Would I brew this beer again? Yes, with some changes. I feel like the aroma is pretty close to what I want, nicely balanced between Citra, Mosaic, and Galaxy, although I’m still lacking the lemon aspect that I remember from the original white IPA I sampled. I think instead of using 3 oz. of Citra in the steeping phase, I might mix it up with a mix of the same Citra, Mosaic, and Galaxy as used to dry-hop, for a slightly more complex flavor. The body is pretty close to perfection, although I feel like I could go to just 2-row and wheat malt for the next batch, rather than a mix of 2-row and pilsner alongside the wheat. I’m also going to up the bitterness a touch; I think the fairly low bitterness was the result of the homegrown whole hops, which can be a little unpredictable. I suspect the alpha acid content was a bit lower on this year’s Cascade crop that I received, so I might swap those out next time for a definitive ~5% alpha hop pellet.